Want to help save some lions in Kenya? 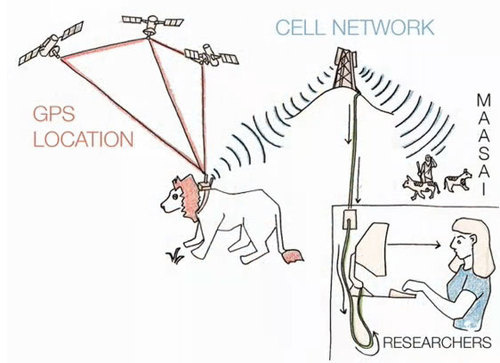 Well, help these guys make some open source lion-tracking collars, complete with GPS and GSM on board. Lions are not doing too well in Kenya, with only 2,000 or so left. Two groups called Lion Guardians and Living with Lions are dedicated to studying and saving the diminished lion population. In order to help them out, Justin Downs of Brooklyn’s GRND Lab built them a solar-powered treehouse last year. Now, he’s working on some of the aforementioned collars to help them track the lions. He’s looking for donations on Kickstarter for the project now, so if your passions create a Venn diagram between open-source hardware and lions, well, here you go. Search giant Google signed a deal with Dulles, Va. startup GeoEye to use imagery from its newest satellite after it launches in September of this year. This is not the first time Google has dealt with GeoEye. It already uses images from its IKONOS satellite, as well as from other sources including DigitalGlobe. As part of the new deal, GeoEye would exclusively provide its imagery to Google. The half-billion dollar satellite is expected to provide the highest resolution images of any imaging satellite currently available. Google would even get a bit of promotion during launch: Its logo appears on the first-stage rocket.According to the two companies, Google did not pay for the logo to appear on the rocket, nor does it have any direct or indirect financial interest in the launch. It appears the Google logo is only on the rocket in recognition of its support for the project. GeoEye says it hopes to launch the rocket from Vandenberg Air Force Base in California on September 4. If all goes well, it should be in its proper orbit within an hour-and-a-half of launch. Imagery will be received by Google beginning in late October or early November, although it’s not clear how long it will take for the images to begin to appear on Google Maps. Imagery could conceivably be available at as high as 0.41 meters in black and white, and 1.65 meters in color. How fine-grained is that? An Italian research project three years ago to study whether it was possible to discern certain types of automobiles that travel around the city of Baghdad (if you work in Baghdad, you’d understand why this is important) from satellite imagery alone, used pictures that had 0.68 meters resolution. And under federal law, only images with as high as 0.5 meters resolution can be used commercially. 14-05-2008 – Two Inmarsat experts have been presented with an innovation award by the mobile satellite industry for leading the development of BGAN. The Mobile Satellite Users Association (MSUA) presented its innovation award to Inmarsat’s chief scientist Marcus Vilaça and director of systems and network engineering, Alan Howell, at its annual conference in Baltimore in the US on May 13. Both Marcus and Alan are proud that Inmarsat’s team has been recognised for introducing a system which has transformed global mobile broadband communications. Alan said: “The award is all the more welcome because it came out of the blue. It’ s great that the industry is recognising that BGAN is a highly innovative system. The pair started working on ideas for a new system back in 1995 – focusing on trying to harness emerging technologies such as the internet and mobile data. The team expanded over time, and BGAN owes its success to the effort and dedication of all those involved in the project. And it was the move to develop a satellite version of the universal mobile telecommunications mobile broadband system – for people who are out of range of terrestrial services – which eventually proved pivotal to Inmarsat’s future success. The team carried out painstaking research, working with external companies to create a flexible and efficient standard BGAN system – which could deliver high-speed data and voice services simultaneously – via satellite.